2013 is the Year of Public Service at ASLA. 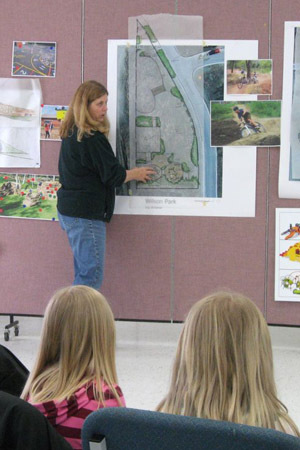 The goal is to highlight the public service activities performed by landscape architects and advocate for a deeper commitment to community service by all. ASLA invites current members to submit projects. Selected projects will be highlighted in the campaign’s Web site and outreach materials. Descriptions, quotes, and multimedia content may be used – with proper credit – on the YPS2013 web site, blog and The Understory Facebook page. Here are two recent public service projects, performed as part of the ASLA’s partnership with the National Park Service Rivers and Trails Conservation Assistance Program. These projects were recently submitted by Heather Rice, NPS-RTCA & Jonny Hayes, ASLA, ASLA’s Alaska Chapter. Kachemak Bay Water Trail (KBWT): ASLA Alaska Chapter members Jonny Hayes, ASLA, and Mark Kimerer, ASLA, have been actively engaged in this project from its inception, working in tandem with the KBWT Steering Committee, National Park Service Rivers and Trails Conservation Assistance Program, and City of Homer. Hayes and Kimerer began the trail branding process by working with a special committee of KBWT to facilitate and generate logo concepts. The pair worked with the committee during the process to refine the selected concept and produce a final logo that has been used extensively to promote the water trail vision, which will serve as a basis to guide future marketing efforts. Hayes and Kimerer have continued to lend their expertise to assist the Steering Committee to identify water trail branding options, develop a site inventory review form, evaluate potential launch sites, and prepare an RFP for the design and build of a water trail web site. In April, Hayes will be leading a planning and programming design charrette with key stakeholders and the City of Homer to begin the design and permitting of the Kachemak Bay Water Trail launch in Homer, with a similar effort to take place in Seldovia at a later date. Palmer Bike Park: The Palmer Bike Park, in Palmer, Alaska, is envisioned as a place where cyclists of any ability can hone their biking skills so they can enjoy all types of terrain. Cyclists of all ages will be able to learn how to bike safely and have fun. At the park, they will gain the confidence they need to ride their bikes anywhere, from sidewalks to roadway bike lanes to back country mountain bike trails. To help move this project forward, Eric Morey, ASLA, Alaska Chapter, and Luanne Urfer, ASLA, Washington Chapter, collaborated with the the National Park Service Rivers, Trails and Conservation Assistance Program. They volunteered a generous amount of their time and expertise as participants in every part of the planning and early concept development process, including crafting the initial vision and building community support. Viewed as stepping stones toward the larger Palmer Bike Park, smaller neighborhood parks and bike pump parks are also being developed to encourage kids and families to get outside and play. The goal is to create a constituency for the bike park. 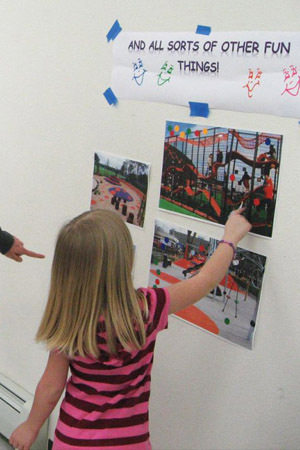 In the Wilson Neighborhood Park, Morey, Urfer, and Zach Babb, ASLA, Alaska Chapter, put kids’ dreams to paper during the 2012 Wilson Neighborhood Park design charrette. 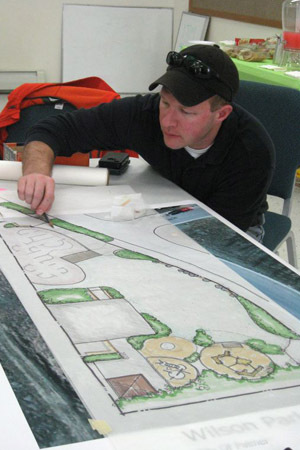 Thanks to these ASLA members’ colorful conceptual drawings, the City of Palmer approved funding for design and engineering and the community now looks forward to construction beginning this summer. With continued support from ASLA – and the community – the Palmer Bike Park is sure to be a success soon.